I was that little kid with the eyes in the sky dreaming of being a pilot. The kid grew up, the dream faded until I changed continents, got a well paying job and decided to do a fam flight in 2004. Pilot license followed in 2006, then glider license, then tailwheel and acro training. I am now living the dream, one flight at a time. I did not fly much this fall. Between being sick and mourning the loss of my father to cancer, I did not have energy or desire to write or work on pictures either. But interspersed with the periods of dark and gloom, were a few memorable moments that got stored in my memory and on my camera and were waiting for me to recover and write about them. Thanksgiving had couple of those moments. Unlike the warm Thanksgiving weekend of 2008, the 2009 was cold to the point of frost. However it did warm up during the morning creating thick fog. 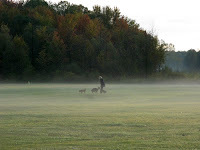 Given the fog, the flights did not get started until later leaving the runway available for dogs as well as RC fliers. October 11 started with the fog but the sun eventually rose higher and burned it out. I was going to fly acro in the FLBY that morning, but by the time we got it ready it was closer to noon and the reports started rolling in reporting good lift conditions. 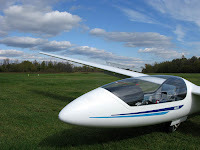 Listening to those reports, I was mulling my choices: to go up in the acro configuration as originally planned or go back to the trailer and put the long tips on and have a longer soaring flight. The desire to fly upside down proved irresistible and soon i was rolling down the runway attached to the towplane. I released at cloud base height of 4,000 AGL and started my acro sequence. 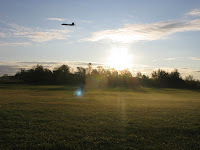 59 has an amazing roll rate compared to any other glider in the club's fleet and I was mostly doing rolls and inverted flight that morning fully enjoying myself. Alas, inverted flying is a sure way to loose altitude in a hurry and soon i was as 2000 ft AGL, the minimum height for aerobatics. 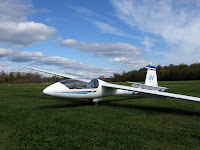 Normally, I would then spend the next 500 ft down doing wingovers and steep turns and start preparing for landing, but from my tow, I knew that the thermals were strong, so i decided to see if i could climb up in the acro configuration (acro configuration means short wings relative to glider weight, so it would only climb in the really strong thermals). It did not take me long to find a strong core that catapulted me back up to the cloud base. As i was thermalling up, i decided to try and do one acro figure couple of times and then climb back up. Thermals were widely spaced and well marked by the clouds, so after climbing, i would fly out on a side in the quieter air, do a lookout then my desired figure and go right back to the same thermal. I did a few hammerheads that way, then half snap rolls, then a few full snap rolls and then I noticed something that was not there before. The wind afloat was strong and clouds started forming the cloud streets. I needed a break from aerobatics, so I decided to follow a cloud street and see if I could gain height while flying straight and level. I followed that street for a while until I had to turn back to club to make sure I stayed within gliding distance. On a way back, flying under the same street, i rolled inverted and flew under the cloud street upside down. I did not climb in that configuration, but i did not loose much height either, so i repeated that for a while - climb away from club following the cloud street right side up turn around, roll upside down and go back towards the club. I did this for a while and then took a note of total elapsed time - over 2 hrs! 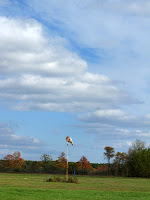 I was glad it was the end of the season as my aerobatic stamina was at its seasonal highest level. Even then, i was starting to feel queasy and hungry as it was way past my usual lunch time. I followed the cloud streets right side up to a bit more to figure out if lift was on one side or the middle and then reluctantly made my way down. I rolled to a stop on a side of the runway thinking that i just had the best flight on my life. "Congratulations, You Are Now a Glider Pilot".